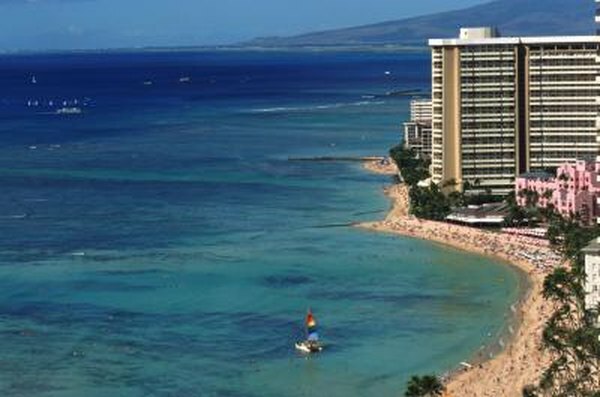 The cost-of-living in Hawaii is very high compared to many other U.S. states. Miles of sandy beaches, spectacular views and a diverse landscape make Hawaii one of the most popular vacation spots in the U.S. It's no surprise, then, that people chose Hawaii as the No. 1 spot where they'd like to retire, other than their home state, a survey by "Smart Money" magazine found. But before you pack your bags and put your house on the market, consider the costs and logistics of living out your golden years in paradise. Thanks to its year-round moderate climate, "U.S. News and World Report" calls Hawaii one of the top 10 retirement states for great weather. In the capital city of Honolulu, for instance, the average low temperature in January only dips to 66 degrees Fahrenheit, while the average high in July hovers around 88 degrees. Bankrate.com calls Hawaii one of the top six states for retirees thanks to low crime rates, an average life expectancy of 81.5 years and a relatively high standard of living. In Hawaii, less than 7 percent of all retirees live below the poverty line. If you do decide to retire to Hawaii, you'll find plenty of company. "U.S. News and World Report" names Honolulu as one of 10 U.S. cities with the oldest median age, which is 41.3 years. Unless you come from Hawaii or another high cost-of-living state, you may be surprised by the high cost in Hawaii for everything from property to food and clothing. In fact, the cost of living in Hawaii is 77 percent higher than the national average in the U.S., reports "Smart Money," with a median housing price just under $500,000. If you're hoping for beach views expect to pay much more. One good piece of news for retirees when it comes to cost of living: The state offers numerous property tax breaks for seniors. Instead of the standard homestead exemption of $80,000 in Honolulu, for example, some seniors may qualify for a homestead exemption of $120,000 to $200,000 based on age, income and property value. Homestead exemption is the amount of your home's value that is exempt from property taxes. Having higher homestead exemptions for seniors means that seniors pay lower property taxes than non-seniors, even for homes of equal market value. Kiplinger.com calls Hawaii a tax-friendly state for retirees. There's no state tax on Social Security or most pensions, and there's no state inheritance tax. If you earn income from sources other than Social Security or a pension, beware of the state's 11 percent income tax rate, which is among the highest in the nation, Kiplinger reports. At 4 percent, Hawaii's sales tax rate is among the lowest in the U.S., and prescription drugs are exempt from sales tax. For many retirees, proximity to family and friends represents one of the most important criteria when deciding where to retire. While Hawaii may feel like paradise, it's also surprisingly far from the U.S. mainland. Round-trip plane tickets from Hawaii to Los Angeles often cost $500 or more, reports "Smart Money," and the trip takes five hours each way. That doesn't include the time and money needed to travel to meet friends and family once you reach L.A.